Ai-Jen Poo is the director of the National Domestic Workers Alliance (NDWA) and a co-director of Caring Across Generations. Given these roles and her work advocating for better protections for care workers, it’s not surprising that Poo’s approach to discussing the consequences and opportunities of the elder boom is framed around the experiences of this often overlooked group within the labor force. 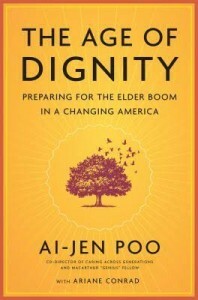 In The Age of Dignity: Preparing for the Elder Boom in a Changing America, Poo illustrates her points with personal stories from the caregiving experiences of her own family and those of personal care workers she has met through her advocacy work. These stories show the dedication of the workers, the good and bad situations they find themselves in, and the skills and expertise required to do the job. They also show how domestic work – informal and professional – is undervalued. An estimated 2 million people work as in-home caregivers in the United States. They care for the most costly clients in our health care system, allowing them to remain at home as most would prefer. They are first responders in a disaster and they support the families as well as the care recipient. Most of these workers are women. About 2/3 are immigrants and about 1/2 of those are undocumented. They earn on average less than $10/hour. Few have employer-provided health insurance, pensions, or paid vacation or sick leave. This is for work that can be rewarding, and is certainly important, but it also physically and emotionally challenging. It’s no wonder that there is high turnover in these jobs. And high turnover leads to poor quality care. At the same time, home care workers are the fastest growing part of the workforce. They are a key component of our long term care system where the number of older adults is increasing and relying on informal caregivers is not sustainable. Poo uses stories and data to put forth a compelling set of recommendations for the future all of which lead to an infrastructure for care that she calls a Care Grid. She notes past investments we have made in infrastructure when there was a national need and the leaps in technological and social innovations that resulted – think railroads, interstate highways, electricity, the Internet. She also looks to international examples of such an investment like Japan and Germany who are head of us in the elder boom. Both countries instituted universal long-term care insurance that led to better care, reduced dependence on social assistance, and expanded growth of private sector long-term care services. In Japan’s case, the system was implemented during an economic recession. So what’s stopping us from making this investment? If we’re willing to invest in highways because we see the national benefit why do we so undervalue the people who care for our loved ones (and someday us)? The care infrastructure (or the lack of it) has a direct impact on the quality of care provided. And, since money seems to speak most loudly, the development of such an infrastructure is a huge economic opportunity. 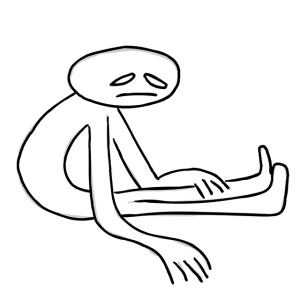 But it requires investment, long-term thinking, and delayed gratification – things that seem to be in short supply right now. And it requires valuing this kind of work – something that requires a fundamental cultural and ideological shift. As always, I’d love to hear your caregiving stories, the good, the bad, and the ugly. What do you think about a Care Grid? Much of the research on welfare state development has argued that economic prosperity (ie., GDP growth) is the key factor for expanding social policies. Of course, economic prosperity is important. It doesn’t always, however, improve a population’s health. The post-communist countries come to mind. This suggests that wealth is necessary for improving health, but it is not sufficient. What countries do with their wealth is also important. Growth in GDP is not just about increases in money. Over time, it’s one piece of larger scale modernization and development which could include (gasp!) changes and growth in the welfare state. Today I am musing on a 2010 article by Olli Kangas that considers the issues of economic prosperity, the welfare state, and life expectancy. Kangas is with the Social Insurance Institution of Finland, known in Finland as Kela. Although the provision of services is the responsibility of the municipalities, Kela oversees the administration of family benefits, health insurance, rehabilitation, basic unemployment security, housing benefits, financial aid for students, basic pensions, disability benefits, conscripts’ allowances, and assistance for immigrants. The punch line of the article is that bigger is better and not just in terms of the level and growth of GDP. More importantly, a generous welfare state with broad coverage does more to increase a population’s life expectancy than economic prosperity alone. Kangas uses a century of data (1900 to 2000) from 17 OECD countries, including Finland and the United States, to support his conclusions. Life expectancy almost doubled from 1900 to 2000 while differences across the 17 countries countries decreased. The increase continues, but at a much slower pace. The variation across countries is greatest during the war years. In the United States, for example, the effect of the war on life expectancy for men was a loss of about a year. In Finland, where the fighting against the Soviet Union was particularly devastating, male life expectancy lost 13.5 years in 1939 to 1940 and 11.6 years in 1934 to 1944. They also suffered losses during their civil war in 1918. Higher life expectancy is associated with higher GDP, but only up to a point. The effect of GDP levels off after a certain point. The United States is an outlier. We have high prosperity, but relatively low life expectancy compared to other OECD countries. (Hooray for American exceptionalism.) Japan is also an outlier with moderate GDP, but the highest life expectancy. This suggests that GDP is not the only important factor determining longevity. The amount of money spent on social programs explains some of the variance in life expectancy across countries, but as with GDP the impact levels off after a certain level of spending. Spending also doesn’t tell us anything about what is being done with the money spent. In some countries, a limited number of people get a lot. Kangas calls this the Central-European cluster where there are “workers insurance” programs with high benefits. In the Nordic model, there are “peoples insurance” programs with good benefits for everyone, if not necessarily the highest. In liberal regimes, very few people get only a little from the welfare state. Life expectancy is higher in those countries with welfare systems that are both universal (where everyone gets something) and what everyone gets is generous. This relationship is linear, meaning it doesn’t level off like the relationship with GDP or overall social spending. I see this last point as good news in some ways because it suggests that perhaps systems can be improved over time without a complete (and politically contentious) overhaul. Stealth policy, if you will, gradually expanding benefits to more people and increasing their generosity. (Shhh, don’t tell you know who). It also suggests that it is better, in terms of overall population health, to give an adequate amount to everyone than to give lavishly to just a few. Of course, that’s assuming that helping everyone be healthier is our goal and that we’re willing to spread the wealth more equitably to make it happen. How many ways can we slice a finite pie? One way of thinking about social welfare spending is in terms of spending focused on older adults and the forces within a country that lead to a “pro-elderly bias”. There is no doubt (or is there? another post for another day) that older adults have more power in some countries than others. In terms of patterns of welfare spending, the United States, according to Pieter Vanhuysse, is one of the most “pro-elderly biased” among OECD countries while Finland is one of the least. While many studies have looked at how population aging has influenced spending on particular programs, less attention has been paid to how the welfare state as a whole or how models of welfare spending evolve as the population ages. To look at this Vanhysse and his colleague Markus Tepe have developed what they call the elderly/non-elderly spending share (ENSS). The ENSS is the ratio of total spending on programs that are clearly targeted toward older adults (eg., pensions, survival benefits) to social welfare spending as a whole. The higher the ENSS, the more “pro-elderly” the system. The average ENSS from 1980 to 2003 for Finland is about 50 and for the US is about 75. To put that in a broader context, the US is one of the most heavily “pro-elderly” biased countries in the OECD along with Greece, Italy, Germany, Austria, Portugal, Japan and Switzerland. The Netherlands, Belgium, Ireland, and the Nordic countries (which, of course, includes Finland) are among the least “pro-elderly”. (I have to pause here briefly because I’m tired of putting quotes around “pro-elderly” (there I go again). This is Vanhuysse’s term and it clearly means pro-elderly in a very specific and narrow way so I’m sticking with it for now – sans quotes – and will unpack issues of age-related biases, pro or otherwise, another time. There are only so many hours in the day and I still have papers to grade). Back to the initial question – does population aging lead to these differences? The short answer – nope. Aging populations has increased overall spending on pensions and related programs, but it’s also led to smaller individual benefits. 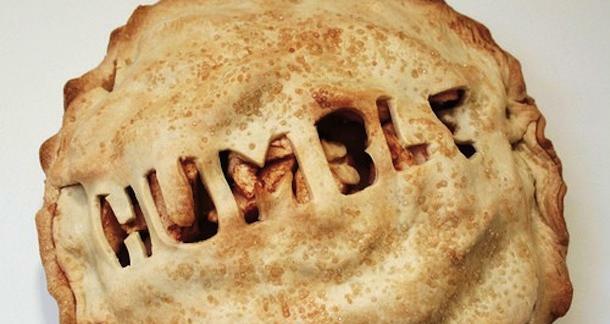 The pie may have gotten bigger, but it’s cut into smaller and smaller unsatisfying pieces. (You knew I’d get to the pie at some point, right?) In fact, countries like Denmark, Finland, and Sweden have lower ENSS values than the US largely because they have made longstanding investments in family-friendly and active labor market policies that positively effect everyone, including older adults. Long-term political and institutional processes explain so-called “pro-elderly” biases, not the proportion of the population that is over 65 or will be soon. The alarm bells that are regularly ringing about the effect of aging on, in the US, Social Security and Medicare may forestall radical cutbacks. That would be politically risky for politicians hoping for the votes of older adults in the next election. It may, however, accelerate incremental changes so it looks like they’re doing something (hence the incredibly shrinking pie pieces, if not the incredibly shrinking pie). Political efforts around narrow issues, like Social Security benefits, are only successful in democracies where there is solid organization of those who are effected (older adults) AND there is already a high level of pro-elderly spending. Or consider the flip side, young families will have better luck demanding state provided childcare when there is intergenerational support for it AND there is already significant state spending in public childcare. “In other words, generational policy models developed in the past can powerfully shape the generational policy expectations of young and old voters today”. We come to expect certain things and advocate for (or vote for) more of the same. How expensive is the welfare state anyway? And does it really matter? The expense of the welfare state comes up in all sorts of political and public conversations even if it’s not worded quite that way. What to do about Social Security, Medicare, health care? Make welfare recipients take drug tests? Dock welfare payments from families who kids miss school? They all have to do with money in some way, but are also code for ideologies and beliefs about who deserves help and how much the government should provide. In the United States, the argument against a more universal approach to social welfare often comes down to money (at least on the surface). Big welfare states are too expensive, we’re told. I suggest that the money argument is a distraction from ideological differences that really underlie this ongoing debate. Social spending includes things like old-age, survivor, and disability pensions; health care; family support; active labor market policies; unemployment; and housing. A number of studies that compare the cost of social expenditures across Organization for Economic Co-operation and Development (OECD) countries find that the expenditures in some countries (like Finland) are overestimated and in others (such as the U.S.) are underestimated because they don’t take into account taxation on benefits and private spending. Finland directly taxes public social benefits at a higher rate – about 18% for public and 22% for private transfers compared to 6% and 12% in the U.S. They also tax different types of benefits differently. In Finland, pension transfers and unemployment benefits are taxed and social security is deducted, but at a reduced rate. In the U.S., pensions are taxed at a reduced rate and unemployment benefits are taxed as earning, but social security isn’t deducted from either. Indirect taxes – the taxes we all pay on groceries, clothes, and other things – are different. In Finland, the average indirect tax rate in 2009 was 20.8% compared to 4.3% in the U.S. That means that the same amount of benefit doesn’t go as far in Finland as it does in the U.S. OECD countries, like the U.S., that have low indirect tax rates also tend to have lower social expenditures. The U.S. has more tax breaks designated as being for “social purposes” than any other OECD country (at about 1.5% of GDP in 2009). These include lower taxes on some sources of income or for some types of households. They also include things like tax credits for dependent children that reduce taxes or exempt some from paying a tax and are intended to do the same thing as a cash transfer. And they include tax breaks that are intended to stimulate some sort of non-governmental provision of benefits like tax exempt non-profits or better tax deals for private pension and health care contributions. These last two play a much bigger role in the U.S. than in Finland where they are virtually nonexistent. So, monetarily there are fewer differences in the amount of social spending across OECD countries than we tend to think. The differences are in the ways in which that spending is funded (indirect and direct taxes versus tax breaks). But are these two means to an end equivalent? And are they really intended to reach the same end anyway? It turns out that the mix of public vs. private spending can end up with very different results, especially when it comes to income inequality. Countries like Finland, where the amount of public social spending is above average and where public spending is a greater proportion of the total, also have below-average income inequality. Countries like the U.S., with low levels of public social spending and where private spending is a greater proportion of the total, have higher levels of income inequality. This makes sense. Private spending like tax advantages toward pensions and health care are more likely to benefit those who start out with more money. Private employment-related benefits (like tax exclusions for employer contributions to health care) only shift income among those who are or have been employed. When social expenditures rely more on private pending than public, the benefits are stacked in favor of those who have more from the start and there are bigger holes in the safety net for the most vulnerable to go tumbling through. The U.S. stands out as having the least efficient net after-tax social spending with both spending and inequality higher than all other advanced economies except for France which has higher spending and Israel, Turkey, and Mexico which have higher inequality. Of course, there is all sorts of political freight attached to notions of income inequality and public vs. private social spending. But there is also growing evidence that inequality has real consequences. This is true internationally as well. The U.S. has greater private spending on health care and education, but notably poorer outcomes in mortality and graduation rates. For those who don’t see inequality as an ethical issue, maybe money will talk since these consequences come with costs. The Affordable Care Act is the most comprehensive reform of the United States health system since Medicare was established in 1965 under President Lyndon Johnson. The US is way behind other developed nations in providing universal health care coverage and our health care system is notable for its inequities and inefficiencies. The ACA is only a small step toward improving this and changes and challenges in its implementation have weakened this effort. At the same time, there are innovations in the law to increase quality and cost control that, if successful, can perhaps inform the efforts of other countries struggling to maintain coverage in the midst of economic downturns. A just published article by John McDonough (Harvard School of Public Health) in a new journal called Health Systems & Reform does a nice job of laying out the basics of the ACA to date. The ACA includes 10 Titles covering access, quality, and cost control. (You can read the full law here if you are so inclined.) Efforts to improve access through health insurance exchanges and other provisions have been most publicized. But provisions aimed at improving quality and cost control are less talked about. They are, however, extremely important because health care spending in the US has increased way beyond that of other developed nations over the last thirty years, but our outcomes are not comparably very good. In short, other countries are doing better in providing quality health care to a larger proportion of their citizens with less money. To address this, the ACA moves health care financing away from fee-for-service to a system that rewards providers for improvements in quality, efficiency, and outcomes. This includes incentives for improving care collaboration across providers and penalties for hospitals with high rates of 30-day readmission and hospital-acquired infections. Other cost control efforts reform or create structures to prevent fraud and abuse, emphasize health promotion and disease prevention, and reform practices in the development and testing of drugs and medical supplies. According to the Commonwealth Fund an estimated 20 million Americans obtained coverage under the ACA as of May 1, 2014. Gallup surveys indicate that the rates of adults 18 and older who are uninsured dropped from 17.1% in the fall of 2013 to 13.4% in April of 2014. The drop in uninsured was higher for African Americans, Latinos, and people who are lower-income. Excluding older adults, the rates of uninsured dropped from 21% in Sept 2013 to 16.3% by April 2014 (a decline of 10.3 million people) (from Harvard School of Public Health and the U.S. Dept. of Health & Human Services). On the not so positive side, the Urban Institute has noted a growing disparity between states that are expanding Medicaid vs. those that are not. In Sept 2013, 49.7% of uninsured adults lived in states not expanding Medicaid. This increased to 60.6% by June 2014. Hospital induced conditions such as adverse drug events, infections, or falls decreased nationally by 9% and Medicare 30-day readmission rates decreased by 8% (from 2011-2012 data from the US Dept. of Health & Human Services). Prices of health care goods and services and per enrollee spending on both private and public health coverage have been rising at historically low rates (from Bureau of Economic Analysis). At this point, it’s difficult to tell to what extent this is a direct or indirect effect of the ACA, but the law has not drastically increased health spending as some predicted. And, the debate, rages on in Congress, the Supreme Court, in the presidential elections to come, and over family dinner tables. As McDonough notes, health reform in the U.S. has always been politically divisive, but the level of politicization around the ACA has been particularly intense. The Kaiser Family Foundation has extensive resources on all things health reform including this interactive tracking poll looking at public opinions of the ACA from the summer of 2011 to January 2015. With some blips along the way, respondents have been roughly evenly split in terms of reporting whether they are favorable or unfavorable to the law. But not surprising, the picture changes dramatically when you look at Democrats vs. Republicans with the majority of Democrats favorable and the majority of Republicans unfavorable. Interestingly, the results are not so clear cut when respondents are asked about specific portions of the ACA. The other important point McDonough raises is about how complex the U.S. health care system is and the influence of past policy decisions on creating that complexity and constraining decisions moving forward. He gives the example of Medicare which began with Part A (for hospital services), then added Part B (for physician services), Part C (which allowed private insurers to participate) and Part D (for prescription drug coverage). Each adds a layer of complexity that, I would argue, a truly comprehensive health care reform should be able to address. But, alas, that’s not the way our political system works. It will be interesting to see how implementation of the ACA continues to unfold moving forward. I’ve been trolling through World Health Organization data for the United States, Finland, and Estonia. (Yes, more fun with data!) For anyone interested in global comparisons in all things health-related, WHO is the place for you. It is a treasure trove. I’m only at the beginning of this part of my project (or any part of my project, to be completely honest) and there is lots to look at, but here are a few things that have caught my attention so far. In 2011, Finland had more mental health outpatient facilities, beds for mental health in general hospitals, community residential facilities, and more beds in those facilities than the United States. The latter is most striking with Finland having 134 beds per 100,000 people compared to only 22 in the U.S. On the other hand, the United States has slightly more mental hospitals compared to Finland and more beds in those hospitals. (According to the only data available on these variables, Estonia has more mental hospitals than either Finland or the U.S.). This dramatic difference in community-based facilities highlights a significant gap in U.S. services for the mentally ill. If you need to put a face on why this matters, read this story in The Washington Post. People cannot get into hospitals when they need it because of lack of beds and others can be held in the hospital against their will because there is no place to discharge them to. Not surprisingly, it costs much less to support someone in the community than to keep them in a hospital. Why then is the U.S. not investing more in community-based resources? (A topic for another day). 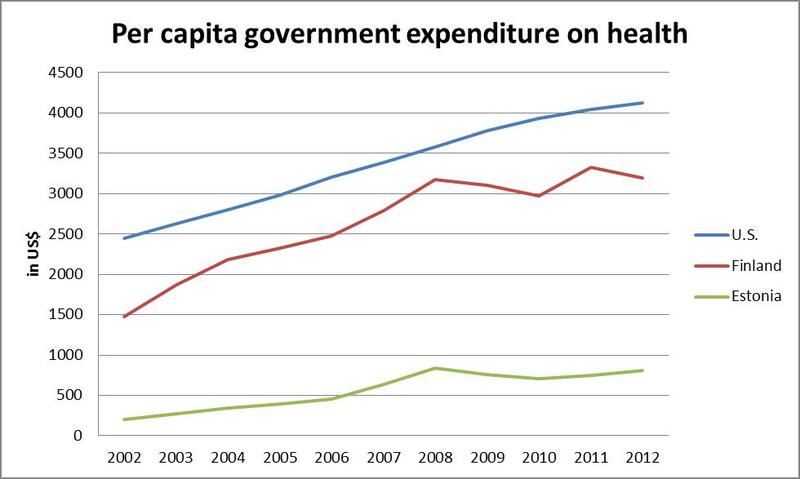 I also find it interesting that, even with universal coverage, Finland and Estonia have lower per capita government expenditures on health than the U.S. and, in fact, since 2008 government expenditures in Finland have fallen. (See figure, based on World Health Organization Global Health Observatory data). So even though most of us pay something for our health care coverage, for many of us our employers pay something as well, and there is great variation in terms of the levels and type of coverage we each can afford, the U.S. government is still spending more per person than two countries where the state provides equal coverage for everyone. Yes, I hear some of you saying, that the citizens pay for it through much higher taxes in Finland and Estonia. That is true. It’s the equal coverage part I’m interested in here. Yet another topic for yet another day – what citizens in each country get for the taxes they pay and how this relates to quality of health care and overall health outcomes.